The Fast & Furious spin-off flick will hit theaters in August. 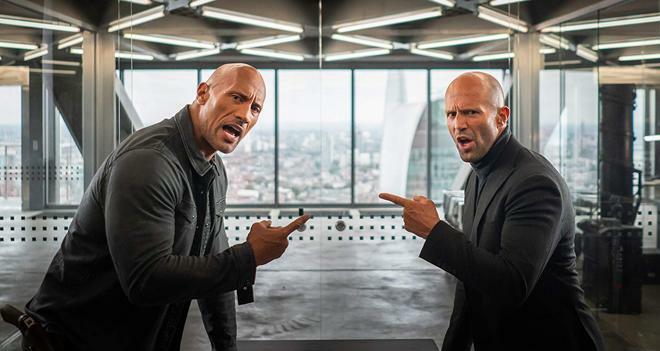 Universal has released the first trailer for Hobbs & Shaw. The film stars Dwayne Johnson and Jason Statham reprising their roles as Luke Hobbs and Deckard Shaw from the Fast & Furious franchise. Ever since hulking lawman Hobbs (Johnson), a loyal agent of America's Diplomatic Security Service, and lawless outcast Shaw (Statham), a former British military elite operative, first faced off in 2015's Furious 7, the duo have swapped smack talk and body blows as they've tried to take each other down. But when cyber-genetically enhanced anarchist Brixton (Idris Elba) gains control of an insidious bio-threat that could alter humanity forever — and bests a brilliant and fearless rogue MI6 agent (Vanessa Kirby), who just happens to be Shaw's sister — these two sworn enemies will have to partner up to bring down the only guy who might be badder than themselves. The film comes from director David Leitch (Deadpool 2) with a script written by Chris Morgan. In addition, Morgan also serves as a producer along with Dwayne Johnson, Jason Statham, and Hiram Garcia. Executive producers include Dany Garcia, Kelly McCormick, Steven Chasman, Ethan Smith, and Ainsley Davies. Hobbs and Shaw is set to premiere on August 2, 2019. The movie is the first spin-off in the Fast & Furious series and will be the ninth feature length entry in the franchise following The Fast and the Furious (2001), 2 Fast 2 Furious (2003), The Fast and the Furious: Tokyo Drift (2006), Fast & Furious (2009), Fast Five (2011), Fast & Furious 6 (2013), Furious 7 (2015), and The Fate of the Furious (2017).